The House of Blues is a chain of concert halls scattered across the United States. The very first nightclub was located in Harvard Square in Cambridge, which closed in 2003. The original owners were comedian Dan Aykroyd and Isaac Tigrett. Tigrett is one of the co-founders of the famous Hard Rock Cafe chain. In 2007, the House of Blues organization was bought by LiveNation, one of the largest concert promotion and ticket sales companies in the country. With 13 concert halls now, the House of Blues establishments are considered a major venue for many performing artists during their national tours. In Boston, the House of Blues is located on Lansdowne Street, directly opposite the left field wall of Fenway Park, the home of the famous Red Sox baseball team. Fenway Park itself is full of history, having opened in 1912, and making it the oldest stadium occupied by a professional sports team in the country. Lansdowne Street hosts several other sports bars and nightclubs, and is periodically closed down to vehicular traffic for special street festivals. 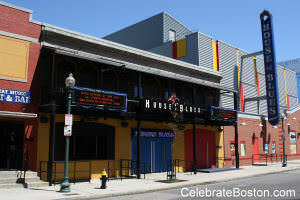 The capacity of the House of Blues in Boston is 2500 people, with different levels of seating, and a bar on each level. There is also a restaurant available for hungry music-lovers. Being a very popular venue for concerts, past acts include Lady Gaga, Buddy Guy, Katy Perry, Tom Jones, Jesse McCartney, BB King, and many other artists. The range of performers includes both renowned artists, and budding musical talents. An interesting fact about the House of Blues is the existence of a private club called the Foundation Room. Members of the club pay thousands of dollars for various levels of membership which entitle them access to luxurious dining facilities and even seats at sold-out concerts. The Foundation Room exists in each of their concert halls. According to online reviews, the concert-watching experience in the House of Blues will vary from event to event, but a look at previous concert-goers' experiences highlight a few things which someone planning to catch an act there should be aware of. First, the mezzanine will not afford people a good view of the stage. One of the best places to be at is the lowest level, either right in front of the band, if that's the kind of experience you're seeking, or at the back, slightly towards the left or the right for a good view of the whole stage. Also, be careful about attending a concert on the same night as a Red Sox game—driving to the venue can be a big headache with all the traffic congestion. As expected with these types of venues, the price of drinks will not be the same as what you get at a convenience store. Expect to pay the price of a 6-pack for just one beer or somewhere in that range for similar drinks. A common theme of feedback regarding staff and security is that things may get obnoxious at times. Expect to be constantly asked for your ticket by people making sure that you are in the right section. Also be wary of the entrance where you or one of your companions could be mistaken for being drunk or, worse, high on drugs. Reportedly, some of the staff members can be downright nasty and impolite while there are others who are extremely professional. If the act you are seeing is by someone very famous, the management has purportedly continued to let people in despite any limits on house seating. This would mean a really horrible experience trying to get a good look at the stage if you're not early or don't have a good spot reserved for you and your friends, not to mention all the pushing and shoving, and discounting the fact that if the band is a heavy rock band, you know how those crowds usually are. The restaurant has been described as nothing special, but it will buy you some time, since diners are exempted from any long lines to get into the place. All in all, the House of Blues is a great venue with great acts, at relatively low ticket prices. The drinks are priced relatively well and the food is ok. However, one needs to lower expectations about the treatment you might get from staff, as well as the comfort one might enjoy while watching the live performances. This article hopefully has conveyed realistic expectations so a very enjoyable musical experience can still be had at the House of Blues.